"I might be old, but I haven't forgotten that a Jarl's first duty is to look after his people." Dengeir of Stuhn is a Nord, and thane of Falkreath under his nephew, Jarl Siddgeir, an Imperial loyalist. He shares his home in the city with his brother Thadgeir, and his servant and confidant Tekla. Every day, Dengeir awakens at 6am and spends the rest of the morning at home. Around midday he makes his way to Dead Man's Drink and remains there until midnight, when he will wander home and go straight to sleep. Dengeir wears the fine clothes and boots typical of a noble. He wields an iron dagger and carries the key to his house along with a selection of upper-class loot and gold. Before Siddgeir succeeded him, Dengeir was himself jarl of the hold. A staunch supporter of the Stormcloak rebellion and rendered suspicious to the point of paranoia since losing the throne to Siddgeir, he perceives Imperial Legion plots unfolding everywhere. If spoken to, his hypervigilance to Imperial intrigue will quickly become apparent. He may say "I was Jarl once. But I was encouraged to step down when I took sides with the Stormcloaks. It was an imperial plot, I tell you! ", "Enemies and ears. Both are everywhere. ", "The war has changed Falkreath, even our neighbors can be our enemies." or "If you're sympathetic to the Empire, you'd be wise to put Falkreath far behind you." Siddgeir himself will defend his succession, if you observe how young he is for a jarl: "My uncle Dengeir was Jarl until a short time ago. His old age and failing health caught up with him, and he stepped down. He now serves us honorably as Thane, and to the great benefit of the hold, I now serve as Jarl." Although Siddgeir says nothing further against Dengeir, his lack of scruples, as seen in his dealings with bandits, suggests that the change of power might not have been so innocent. Siddgeir's steward Nenya, who was originally appointed to the position by Dengeir, supports this claim: "When Dengeir's health began to fail, young Siddgeir was appointed Jarl in his stead.". The housecarl, Helvard, also implicitly supports Siddgeir's version of events: "Dengeir was a good Jarl in his day. Even if his day has passed." However, if you ask Dengeir about his time as jarl, he will offer his own, contrasting account: "Aye, not so long ago. Some'll tell you I stepped down on account of my old age. Truth is, I found out about all the Imperial spies crawling around Falkreath. A few well-placed bribes, and they bought themselves some friends." 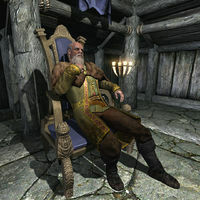 He will continue, implicating not only Imperial spies but also Falkreath's nobility; "Suddenly the nobles are calling for a new Jarl, and all the while their pockets are jingling with the sound of Imperial septims." Finally, he will seethe once more about his nephew's Imperial sympathies: "They named me Thane, and they got my nephew Siddgeir in my place. A real friend to Cyrodiil, that one." Dengeir makes no secret of his feelings about Siddgeir, and he will openly tell you "My nephew has always been handed things, even the title of Jarl." He will also openly insult Siddgeir and even accuse Tekla of spying for him: "Be mindful. My maid Tekla has been known to pass information to that pompous nephew of mine, Siddgeir." Dengeir suspects Tekla of spying, although no evidence ever materializes. A more convincing sign of paranoia becomes evident when Dengeir accuses his former housecarl Lod, now the local blacksmith, of being an Imperial spy. Dengeir will suggest to you that a letter he has recently seen Lod write is a secret report to General Tullius, military governor of Skyrim under the Empire. When questioned, however, Lod seems to be the last man who would work against Dengeir. The blacksmith states that he "risked [his] life more than once to protect" Dengeir: "Why would I do that? For money? Because I swore an oath? No, it was because he was a good man and a true friend." Dengeir does not appear to be completely immune to reason. When you steal Lod's correspondence on Dengeir's instruction, he begrudgingly admits that its contents—simply a request for iron ore—prove his accusation incorrect. He will still maintain that the request indicates that the "Empire is making Lod smith up more swords and armor for them." Thadgeir doesn't quite call his brother paranoid, but does say that he is "difficult" and advises you to "take his words with a grain of salt." Like many Stormcloaks, Dengeir appears to value loyalty to the province above all else. He asks you if you are "loyal to Skyrim" before asking you to spy on Lod, and calls the rebels the "sons of Skyrim". Dengeir will be restored as jarl if you help liberate Falkreath Hold, or if Falkreath Hold is handed over to the Stormcloaks as part of the negotiations during Season Unending, while he will exile Siddgeir and Nenya to Solitude. Upon becoming jarl, Dengeir seems to lose some of his more overtly paranoid tendencies. 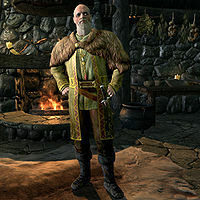 When asked why he considers himself a better jarl than Siddgeir, he does not mention the latter's Imperial allegiance, but alludes to his moral character: "For one thing, I won't empty Falkreath's coffers to buy myself fine clothes an' expensive mead. For another, I won't get mixed up with criminals and other sorts who take advantage of the honest folk for profit. I might be old, but I haven't forgotten that a Jarl's first duty is to look after his people." But in this event, Dengeir will remain alert to the possibility of Imperial intrigue. He will still occasionally whisper to you: "Mind what you say! The Empire has ears all over this town." If he becomes jarl, it also becomes apparent that despite his suspicions of her, he still trusts Tekla. He will select her as his new steward, and on the subject, Tekla will say "when he was made Jarl again, he didn't wait a moment to name me his steward. He said I was the only choice." As jarl, he will also reveal that despite his vigorous support of the rebellion, he, like Jarl Laila of Riften, has doubts about Ulfric. He states that he is under no illusion that, to Ulfric, the restoration of Talos worship is merely a pretext for his ascension as High King. However, he claims that Ulfric is at least "the devil I know" and preferable to rule by the Emperor, who he says is "so far away he might as well be on one of the moons." If Dengeir becomes jarl due to negotiations during Season Unending, and the Imperial Legion subsequently retakes Falkreath Hold, Siddgeir and Nenya will return to Falkreath and Dengeir and Tekla will be exiled to Candlehearth Hall in Windhelm. You cannot receive the quests Dark Ancestor or Some Light Theft from him if he has been exiled to Windhelm. This page was last modified on 16 October 2016, at 05:08.